Select the foreign word or phrase in your notes, right-click the selection, and then click Translate. The Research pane opens, this time with Translation set as the default search engine. If necessary, select the appropriate languages in the From and To boxes under Translation. For example, if you’ve selected the word étudiant in your notes, you could select French in the From box and English in the To box (see Figure 3). Figure 3. When using the Research task pane for language translation, you can choose the language from which to translate and the language into which to translate the selected text. Click the green Start Searching arrow at the top of the task pane and then look for the translated result in the results list. If you frequently translate text in your notes in this way, you might want to set specific translation options to exclude languages that you’ll never use. To do this, click the blue Translation Options link that appears under the Translation heading in the Research task pane, and then select your choices there. If using the Research task pane for on-the-fly translations isn’t quick enough for you, you can opt to use OneNote’s built-in Mini Translator instead. This built-in translation engine lets you rest the mouse pointer over foreign words in your notes and translate on the fly. Using the Mini Translator, you can also play back certain text to hear its pronunciation. Before you can use the Mini Translator, you must first set the language into which you want to translate selected text in OneNote. On the OneNote ribbon, click Review, and then, in the Language group, click the small downward-facing arrow at the bottom of the Translate button. On the pop-up menu that appears, click Choose Translation Language. 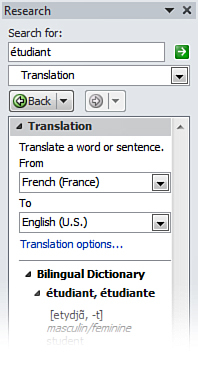 In the Translation Language Options dialog box that appears, click the Translate to drop-down list and then select French (France) or any other language that you prefer. Once your preferred translation language is set, you can start using the Mini Translator.